Autogenerates PoserPython script to recreate the current material. Outputs the script to a debug window for copy-and-pasting. As with all my scripts this was written for my own use. Its intended purpose is as stated above and it seems to work as intended. As always you use it at your own risk - a sensible precaution is simply to save your scene before running the script. 3DCheapskate (11 months ago) Inappropriate? (2 years later...) hope you found it useful ! 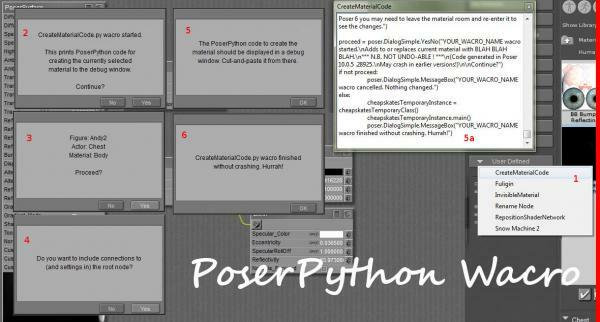 I just noticed a minor bug in the autogenerated code if the root nodeisn't 'PoserSurface'. Although the code to delete all nodes (except root) uses the correct 'kNodeTypeCodeXXXX', it always compares node name with 'PoserSurface', which is of course wrong. Simplemanual edit to the autogeneratedcode to fix it. I've just worked out how to assign one of my wacros to one of the 10 wacro buttons, and how to use the 'WacroMaterials()' function ! All autogenerated scripts will give you the option to delete all existing nodes (except root) or to keep them. When you run CreateMaterialCode you can select whether or not to include the root node. This allows you to create a wacro to set up a complete material, or simply agroup of interconnected nodes to add to a material.